Oh Marks and Spencer how I love your posh crisps, and the range that comes out for Christmas always makes me smile. 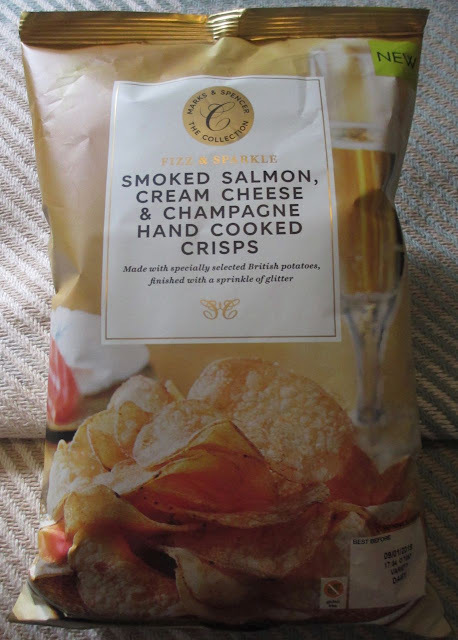 Last year they brought us Bucks Fizz flavour but this year they have surpassed themselves; they have chosen the perfect starter to a Christmas dinner; Smoked Salmon, Cream Cheese and Champagne and turned them into crisps. Incase you thought that didn’t quite sound posh enough for you, these crisps come with added glitter too! These are clearly intended to be poured into a bowl to be shown off at a Christmas gathering, but I’m still eating them with my sandwiches, and just having a posh lunch! I opened up the bag and was impressed by the aroma, it really did smell like smoked salmon. 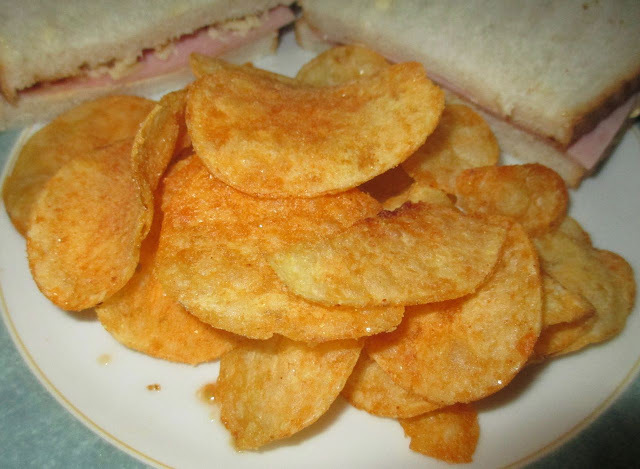 I poured some out and spotted that the crisps didn’t have as much edible glitter sparkle as I would have liked, you really had to know it was there and look for it, just the odd speck. Taste wise the salmon was a little more muted and it was the cream cheese that came to the forefront. The smoked salmon taste hit as the aftertaste, and was delicate but still with the very specific smokey fish flavour. There was also a lovely acidic shot at the end from the champagne keeping them fresh flavoured and giving them a gentle bubbly buzz. They manage to carry a very complex flavour very well, and yet remain easy to eat. I have always had a weakness for fish flavoured crisps so I was in heaven with these, I will be buying more before the season is out!